Description Of Item: One look at Trap Jaw, evil henchman for Skeletor, and you know this crazed cyborg?s no bark, all deadly bite! Ready for battle, one of the most fan-requested figures ever comes complete with three interchangeable attachments that hang from his belt when not connected to his arm, plus a swappable left arm and extra head to transform him back to Kronis. 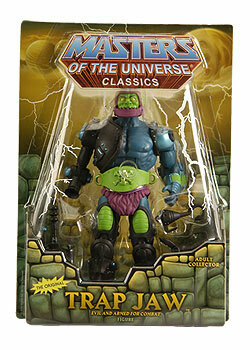 Use extreme caution around Trap Jaw ? just like the vintage toy, his mouth is on a hinge that opens and closes!